The Waldale Irwin Hodson Group is North America’s largest private manufacturer of license plates. Sutherland Presses has been a manufacturing partner for WIHG since 1996. The Waldale Irwin Hodson Group is North America’s largest private manufacturer of license plates, servicing 20 American states and Canadian provinces. The combined output of WIHG’s multiple factories results in 11 million plates printed per year in nearly 1000 different designs. The license plate manufacturing process begins with massive coils of aluminum, which are fed into a press line that stamps out the standard blanks of 6”x12” rectangles with rounded corners. These blanks go on to a traditional embossing process. Sutherland Presses has been a manufacturing partner for WIHG since 1996. Our first press shipped to WIHG’s headquarters was a Mark Series 121-ton gap frame press. Satisfied with their investment, WIHG went on to order another Mark Series press for their headquarters, as well as two Mark 88 presses for one of their other factories. In March of 2016, one of WIHG’s factories was in need of a new press for their blank stamping line. Jean knew that Sutherland was his best bet: “I didn’t do a lot of shopping around”. Sutherland and WIHG agreed that the right press for the job was the next generation of the Mark series press. The Gen 2 Mark Series Single Point Gap Frame press exemplifies Sutherland’s commitment to innovation in metal forming, with numerous improvements made over the first generation. With more steel in the C-section of the frame, angular deflection is reduced under full stamping loads, allowing for better performance in bottom coining and allowing WIHG to form the letters of the plate with reliable high definition. The slide guides are designed with a taper wedge to assure long die life during production runs. The Gen 2 also features a larger flywheel, supplying more energy and higher potential strokes per minute. Overall, the Gen 2 Mark Series presses are stronger and more feature packed than any gap frame press on the market today. 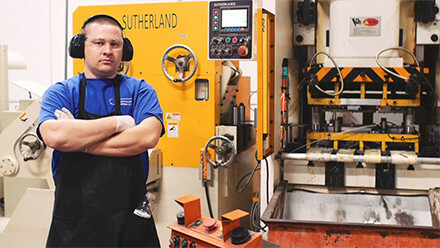 With stamping lines powered by Sutherland Presses for more than 20 years, WIHG has been able to take on the demanding challenges of producing accurate work at high speeds. Sutherland looks forward to providing WIHG with reliable metalforming solutions for the next 20 years and beyond.